I love this, as it’s really calming. Thanks for sharing. Great Photos and Poem; thanks John !! Yes, you are so right Zukakezo! It is a shame and so sad 😦 that greedy wealthy people put profits ahead of health, peace of mind, clean water, air and quality of life! It is as a ‘collective’ that we must speak out against such atrocities and play our part to preserve nature :). Whereas we know that disaster will come back to us, if we ignore nature, but because of the indifference of the future, and because of being pressured by life needs, people are not afraid to destroy nature. Everytime I see the destruction of nature, I felt we were walking towards the end of the world, and everytime rains fall and revive the green nature, I feel like to live forever with nature 🙂 yes I so agree, we need nature for survival ! That photo is spectacular. How did you do that!?! Nature did it all for me. 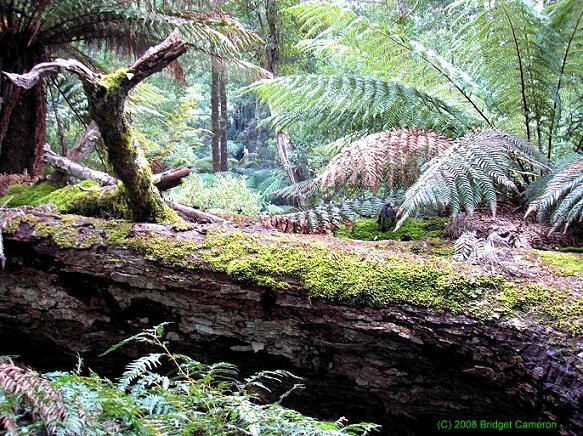 I was in the Meander Forest Reserve in NE Tasmania, soaking up nature. The log you see in this photo is where I sat for about an hour, listening to the stream and the quiet activities of possum, lizard, and birds..It’s a truly magical place :).